What’s better than the first sip of a hot cup of coffee made just the way you like it? Well, maybe if that hot cup of coffee did double duty as fine art, you’d enjoy it even more. 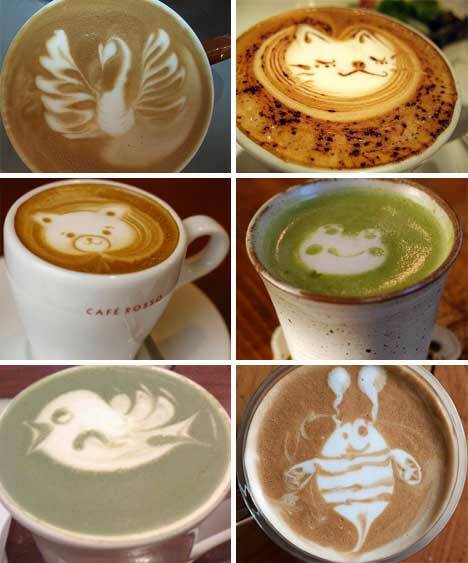 It’s hard to tell just how long baristas have been creating tiny works of art in coffee cups; latte art has been around in the U.S. for at least two decades, since coffee houses in Seattle began pouring simple patterns into the foam portions of their drinks. Since then it’s evolved into an international obsession, including classes, competitions, online galleries, and coffee houses that promise a work of art with every drink. 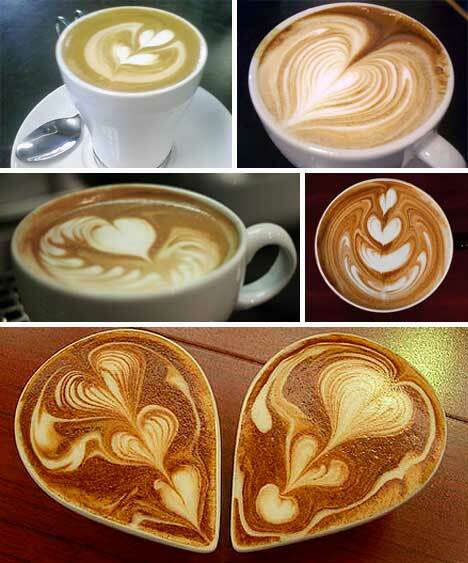 Hearts were one of the first latte art designs to become popular, and they remain one of the most commonly-seen designs today. By preparing both the espresso and the milk foam just right, baristas can masterfully move the milk pitcher while pouring the milk into the coffee, thus creating these remarkable, if completely temporary, designs. 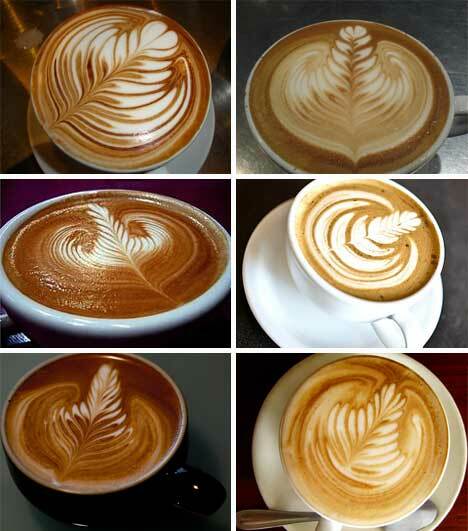 Rosettes or rosettas, the lovely leafy designs above, are another long-standing latte art favorite. The man credited with bringing latte art to the U.S. is David Schomer, coffee industry leader (sometimes called a “coffee prophet”) and owner of Seattle coffee shop Vivace Espresso. He saw a photograph of a rosette pattern made in an Italian coffee shop and recreated it in his own shop, thus securing the rosette’s position in latte art history. When Schomer and his employees started making shapes in their customers’ coffee drinks, they were often asked if it was intentional. 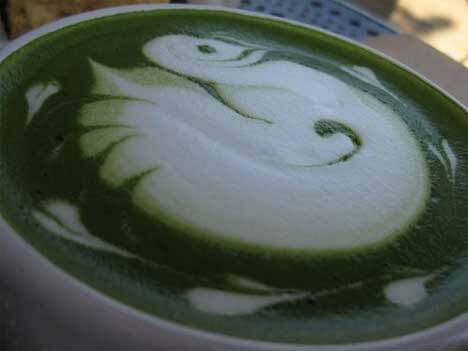 It’s easy to imagine that a heart could be a happy accident, but since then baristas have moved on to creating much more complex shapes and patterns. Creating a memorable piece of latte art is all about the interplay between the milk foam and the “crema” of the espresso. Mastering latte art is even more difficult than most people imagine. 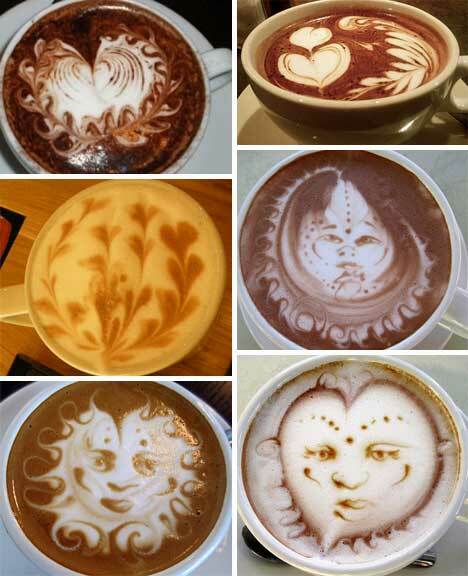 There are so many elements that go into making an impressive cup of art that it’s hard to get them all down perfectly. Along getting with the temperatures, textures and colors of the coffee and milk just right, the barista has to practice extensively to be able to predict how the art will come out. After mastering the simple patterns and shapes, he or she can move on to the more complicated designs. 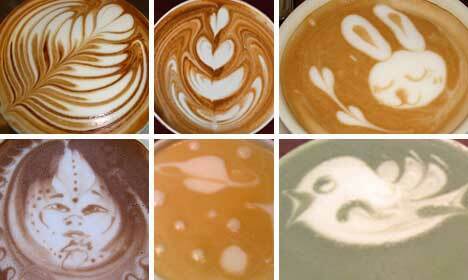 Another factor that coffee art baristas have to overcome is the medium itself. 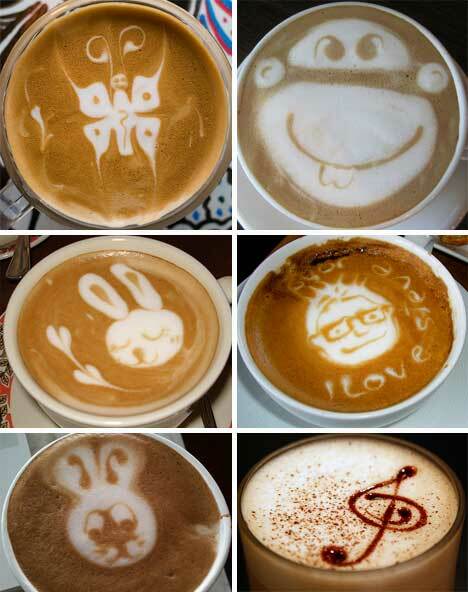 Foam only stays stable in hot coffee for a short amount of time, so the art must be created quickly. But there’s little room for error since the foam is unforgiving and there’s no way to erase a mistake. Certainly not the least of all worries is the thirsty customer who just can’t wait to get their hands on that mug of steaming deliciousness. Some latte art uses only the arm movements of the barista to create shapes in the milk foam: this technique is called free pouring. But there are plenty of other ways to create art in a cup. A technique called etching involves using a stirrer to manipulate the coffee and foam to create defined edges and shapes. Some baristas use chocolate or caramel syrup to write or draw on top of the foam. And from time to time, you might see a design in cinnamon or chocolate sprinkles laid on top of the foam with the help of a stencil. 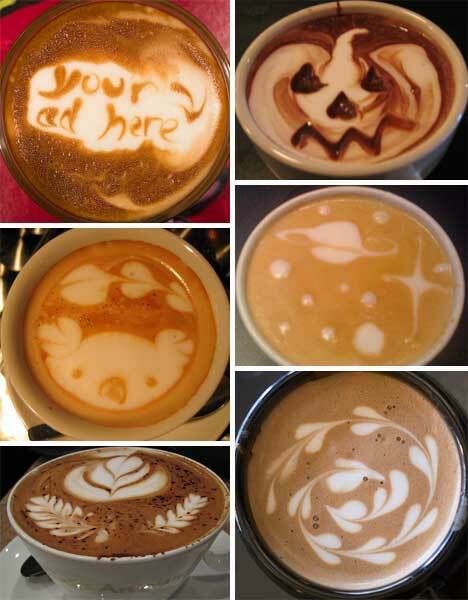 Some coffee shops have made names for themselves by including stunning latte art with every order. 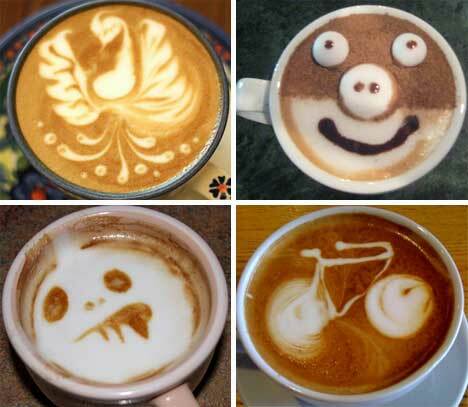 Customers come in for their creative handiwork as much as they do for the coffee. Latte art is such serious business for these shops that every barista is required to attend lessons on making the designs and patterns, and they are encouraged to develop their own signature style to wow customers. 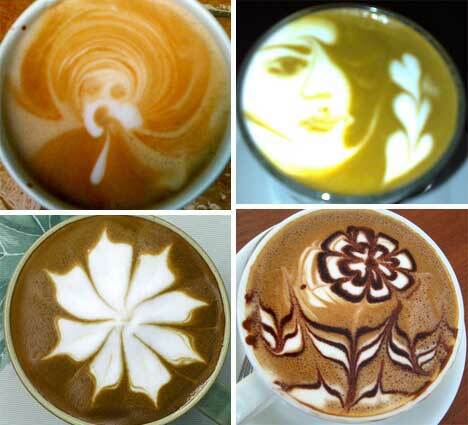 In the hands of a capable coffee artist, just about any kind of design is possible. It can take years of practice to get good enough to create original designs, but many baristas are so passionate about coffee that they don’t mind putting in the time to learn. 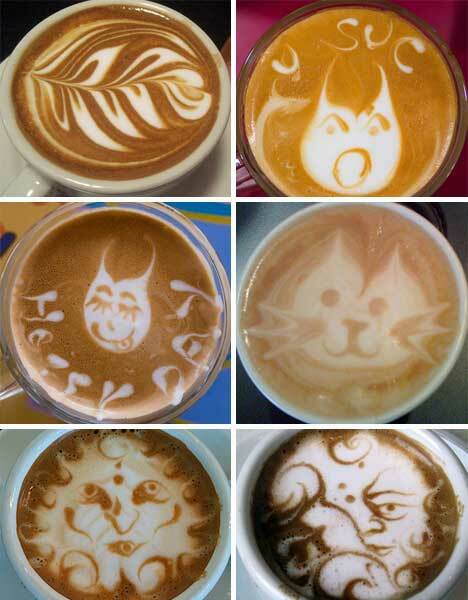 These amazing coffee designs can be seen in coffee shops all around the world, from Seattle to Tokyo and everywhere in between. Of course, with the rise in popularity of latte art have come the inevitable downers: the people who say baristas are spending too much time on the art and not focusing enough attention on the coffee. Making fabulous coffee is, of course, an art of its own – so is it too much to ask that coffee shops serve a delicious cup of coffee that’s also beautiful? According to the many coffee shop aficionados out there, it seems that there are plenty of places to find a cup of coffee that satisfies both your taste for divine coffee and your taste for unique temporary art.